If you have a property large enough and you don't mind sharing your house with strangers, then opening a bed and breakfast can be a rewarding thing to do. To help anyone considering such a venture, we've put together a handy list of products you may want to consider. Government guidelines state that if you are receiving paying guests, then you will need to abide by fire safety laws, these include carrying out regular fire risk assessments - full details can be found here; https://www.gov.uk/government/uploads/system/uploads/attachment_data/file/11085/payingguests.pdf The guidelines state that fire exit signs are not necessarily compulsory, but will be required if escape routes are not obvious or are complicated. You may also wish to consider displaying some ‘no entry’ or ‘private’ signs on doors through to areas reserved for you. Once you start opening up to paying guests, you are going to need to get serious with the cleaning. 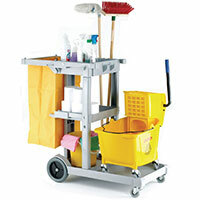 Whether it be the increase in laundry, needing to keep communal areas free form muddy footprints or cleaning bathrooms, a janitorial trolley can keep all your cleaning equipment together, you’ll be whizzing around the house with it and housekeeping will be a breeze. The Health and Safety (First Aid) Regulations 1981 state that workplaces must have first aid provision that is adequate and appropriate. What constitutes adequate will depend on the size of your house and the amount of paying guests and staff, but even in a standard house, having first aid on hand is never a bad idea. Make sure your car park is accessible all year round and that visitors can get down your path without falling over. Ensure your guests have a safe stay inside and out by keeping walkways and parking areas frost-free. Grit bins are available to keep salt clean and dry and you can get them in a variety of styles and sizes to suit. Tap into the ever expanding market for cycling by providing guests with convenient way to secure bicycles. You could go for a simple ‘toast rack’ style device (perhaps appropriate for a bed and breakfast establishment?) Or a full on lockable cycle shelter with canopy, this would work well if you could imagine yourselves providing a cycle hire service for guests unable to transport their own bicycles from home. Let your guests know what is happening both in terms of check-out times and any events in the wider area. Display your breakfast menus, emergency contact numbers and other useful information such as local taxi companies and bus and train timetables on your notice board. Businesses generally have to pay for waste and recycling collections. But you may be surprised to learn that recycling waste can actually reduce your commercial refuse bills. By sending waste for recycling and avoiding adding to landfill you can save yourself paying out on landfill tax. Many private waste collection companies can provide bins and containers, or you can select your own outdoor recycling bins to suit your requirements. 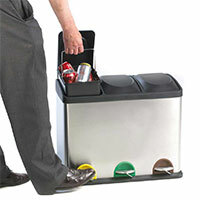 Don’t forget to provide recycling bins internally too, both in guest bedrooms and communal areas for use by guests too to make waste separation as simple as possible. You are not just cooking for yourself anymore, the second B in B&B means that in the morning, people are going to be expecting some bacon and eggs. Store all this extra food hygienically and conveniently using some chrome food storage shelves. Disability Discrimination Act (1996) states that service providers must take reasonable steps to ensure their premises are accessible to all. If there are steps up into your bed and breakfast these can prove tricky for people with limited mobility or for wheelchairs. Have a portable access ramp to hand so that you may quickly create a sloped entrance. If you don’t have the facility to provide accommodation on the ground floor it’s also worth giving thought to installing a stair lift. 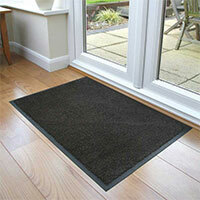 Protect carpeting and other vulnerable flooring around heavy traffic areas with some hard-wearing entrance mats. Footfall across your threshold will never have been so high (except perhaps of that on party nights). Using mats will make your flooring last longer and cleaning easier. It’s worthwhile investing in some washable mats that you can simply pop into a washing machine helping to keep your floors clean and hygienic. Hopefully you’ve found this guide to setting up a bed and breakfast helpful. Please let us know if you’d like us to source any of these products for you and we’ll be happy to assist. Either give us a call on 0808 278 3258 or visit our website http://www.esedirect.co.uk. Bacon rolls and a cup of tea all round.